Photo of the programs offered by Ministerios Sociedad Lucas. 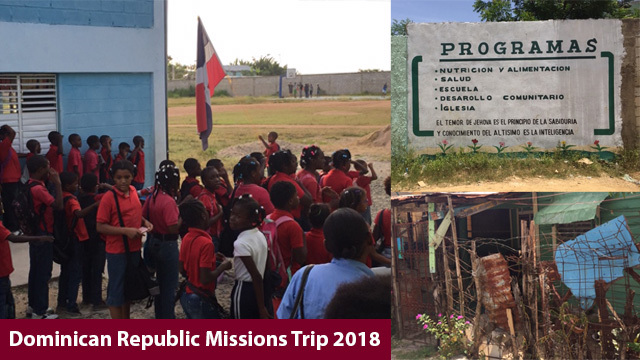 For the last several years, we have traveled to the Dominican Republic to the village of El Cacique to support Ministerios Sociedad Lucas established in 1991 by Dr. Silvia and Samuel Martinez. We have helped them achieve their vision of providing a safe haven for children in the local community by taking part in the construction and funding of a school and hospital. In addition to helping with these facilities, we have also been building latrines in a poor community of Haitian refugees to give them a safer alternative to using the restroom than the sugarcane fields. These latrines protect women and children from assault when they are most vulnerable. While we spent time in the community getting to know the locals, we also host a training conference for the teachers in Silvia's school and lead a Ladies' Bible study. This year we will be working on another construction project. For those unable to participate in the construction project, a painting project is available. Please pray for God to bless our friends in the DR and for Him to be glorified through our trip.